The team poses with workers from the local Bedoul tribe. 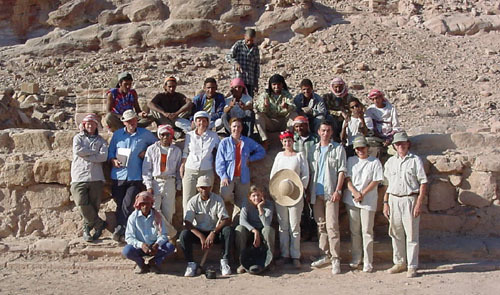 Middle row (l-r):Â James Schryver (Cornell University), Fawwaz Ishakat (surveyor, Hashemite University), Nasser Qoblan, Kathryn L. Gleason (garden archaeologist, Cornell University), Leigh-Ann Bedal (director, PhD, University of Pennsylvania), Kelly Cook (SUNY Syracuse) [seated front], Aicha Malek (Dumbarton Oaks), Salim Qoblan, Chrysanthos Kanellopouls (architect), Huda Kilani (Jordan Department of Antiquities), and John E. Foss (agronomist, University of Tennessee). A team of specialists in geophysics, agronomy, garden archaeology, landscape architecture, and archaeological mapping, including several collaborators in Dumbarton Oaks' Handbook on Garden Archaeology, provided an interdisciplinary aspect necessary for the investigation of an ancient garden site.